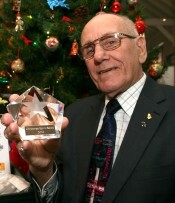 Hull charity EMS Yorkshire is looking for a 2011 winner of its Christmas Spirit award, which celebrates someone whose good deeds should be recognised. The Christmas Spirit Award has been devised by EMS, which delivers neighbourhood management services in the Southcoates East Ward area of Hull and runs the environmental contest, Park Area in Bloom. Last year’s inaugural winner was pensioner Keith Power for his voluntary work at St Aidan’s Church in Southcoates Avenue. Nominations, which must be for people who either live in the Southcoates East area or do their work in the Ward, can be made straight away but all entries must be in by December 17th. Contact Andy Rees on 01482 709810, email andy@emsyorkshire.co.uk or write to Andy Rees, EMS Yorkshire, Unit E, Preston Road Village Centre, Hull HU9 3QB, giving reasons why your nominee should be considered. Andy is also on the look-out for prize donations from local companies. (Photograph is the 2010 winner Keith Power).